There is the most amazing Eucalyptus tree just off the road on the way from Hobart to Campbell Town in Tasmania. It is so tall and all hollow inside. We stopped the car and stepped over a fence just to get near it to take pictures. Referencing those old photos of the tree, I carved this wood block that measures about 4.5” x 14”. 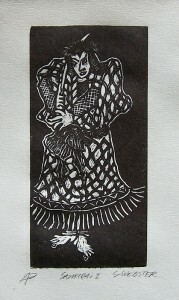 It has been printed in an oil based black relief ink and run through the etching press. When completely dry, I added color using only watercolors that were made from the soils of Australia. 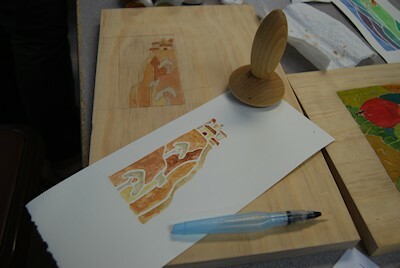 Here I am showing the process of white line printmaking. An image is transferred to a large wooden block and the lines carved away, leaving what will be a white space between colors. This particular one is of Roussillon, home of the famous Conservatory of Ochres. The village sits high on a ridge of exquisite earth colors. I used watercolors made from my collection of gathered and purchased pigments of France to print each of these unique relief prints. 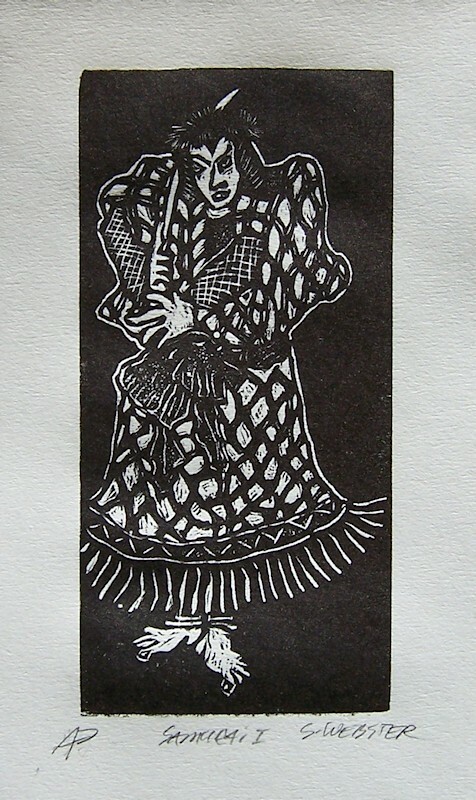 Inspired by the costumed Samurai warriors with their weapons and posture, I wanted to carve a small (3” x 6”) wood engraving. The graving tools and end grain wood blocks make it possible to get much more detail when carving the image. The sound the tool and wood make together is a delightful “scritching” sound – somewhere between a whisper and a scratch.